Vocativ analyzed over 600 presidential speeches in US history, measuring syllables and keeping track of word and sentence count to determine the Flesch-Kincaid reading level of each speech. In the beginning, presidential speeches were at the level of a PhD, now it's at the reading comprehension of a 7th grader. "It's tempting to read this as a dumbing down of the bully pulpit," Jeff Shesol explains. "But it's actually a sign of democratization. In the early Republic, presidents could assume that they were speaking to audiences made up mostly of men like themselves: educated, civic-minded landowners. These, of course, were the only Americans with the right to vote. But over time, the franchise expanded and presidential appeals had to reach a broader audience." 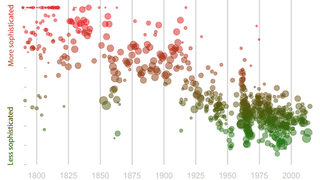 The dots on the graph represent presidential speeches over history (the bigger the dot, the longer the speech). For reading level, an 8 is equivalent to 8th grade, 15 to a college graduate and 21 to a PhD.